Showing 2 articles from March 22, 2014. WASHINGTON, DC – Congresswoman Jaime Herrera Beutler announced March 12 that she has cosponsored legislation that would extend protections relating to citizen’s private e-mail and online communication. Photo by JoDean Jordan From left are Samantha Angelovich, Alex Gilbert, Kendahl Patterson, Hannah Riggs, Abril Silva, Gabby Oatfield, Madeline Maden, Jenny Crow, Blanca Lopez, Mikayla Collins, Marissa Crawford, and BreAnna Makee. 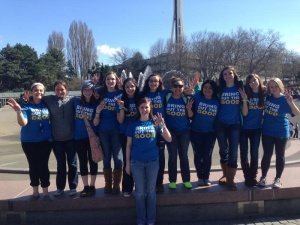 On March 21st the Raymond High School Leadership Class attended We Day at the Key Arena in Seattle.